Thinking of remodeling your Missouri City Texas kitchen? Infinite Designs has provided Kitchen Remodeling to Missouri City homeowners since 2014. Nothing adds to pleasure and pride of home ownership like a brand new kitchen. Your kitchen is the core of your home. Infinite Designs can create a beautiful, functional kitchen that you'll enjoy working in, gathering in and entertaining in for years to come! Missouri City Kitchen Remodeling – Within Budget! Whether you are looking for a some simple updates, such as new countertops and appliances, to modernize your kitchen, or are in the market for a full kitchen remodel, Infinite Designs delivers! Kitchen remodeling doesn't have to break the bank. Infinite Designs can work within your budget to provide the most economical yet attractive cabinets, counters and flooring. 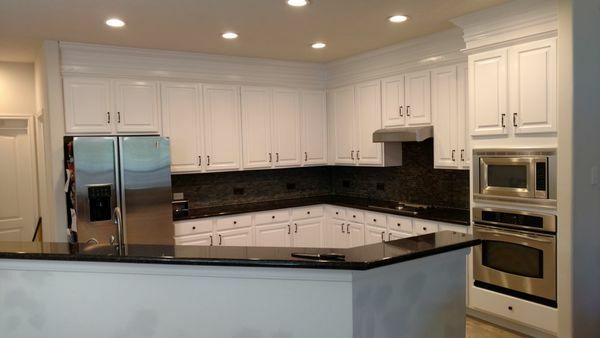 Our Missouri City kitchen remodeling team will work within your budget to provide the kitchen improvements that you require, and a few extras that you desire. Infinite Designs can help you choose architectural styles that will blend your new kitchen with the current design and feel of adjoining rooms. Whether you are currently working with a kitchen designer or need help configuring a new kitchen space, the Missouri City kitchen remodeling experts at Infinite Designs are experienced in working closely with customers from start to finish. We'll help you consider work space needs, while implementing a style that will create a flow from room to room within your home. Working within budget your does not mean having to corners. Infinite Designs craftsmen take great pride in remodeling Missouri City kitchen spaces, economically, while honing in on the details. From seamless tile floor installations, to configuring a kitchen island that is tailored to your unique needs, our kitchen remodeling professionals don't miss a trick! 5★★★★★ - "Alex did a great job building a gorgeous wainscoting, adding so much character to what it used to be a boring grey wall." 5★★★★★ - "I called to have my bathroom wall done. Alex told me it would take two days. He came and did the job in one day and did a great job. The bathroom looks great and my family loves it.Very professional and did a great job from beginning to end. I will use them again on my next remodeling project." 5★★★★★ - "Alex and Nadia and Franco are very professional and polite and built my shed quickly and solidly. They had to work with our existing little pavillion which was a little wonky, but it turned out exactly how I pictured it. They arrived at the time they said, and finished the project in less time than I expected. Great to work with!" 5★★★★★ - "We found a great professional to complete our bathtub to shower conversion after two previous disasters with contractors. Thank you, Alex, Nadia, and John for a job well done!" 5★★★★★ - "Alex did a wonderful job, we hired him to paint my sons room and ended up painting the entire indoor of our home. Thank you Alex for your excellent service." 5★★★★★ - "Mr. Alex and Nadia have been super polite and professional , their quick response is so great!! They installed a bathroom cabinet and the hardware for our kitchen cabinets and they look amazing !!! I will definitely hire them again for our next project!!!!" 5★★★★★ - "They sanded some marble in my shower. Did a perfect job. Looks great. The gold from the shower door had stained the marble. They got it all out!" 5★★★★★ - "My husband and i hired infinite designs for our bathroom and kitchen renovation. Alex did a great job at explaining each step of the renovation and everything was done at a timely manner. Our friends and family are absolutely amazed by the change of our home. We highly recommend Infinite designs. Thank you Alex for the great work." 5★★★★★ - "Alex and Nadia from infinite designs are the real deal. Easy to work with, professional and responsive. Highly recommend this company!"